We’d like to share a little of the history of Tony’s Italian Beef. First and foremost, it is a family run business, and we at Tony’s Italian Beef are proud of being a member of Chicago’s Southside community since l975. When the doors first opened only family members were employed, they included Grandpa Tony, Tony, Sister Theresa, Brother John, brother-in-law Johnny “D” and Uncle Benny. Tony’s three sons joined the staff as soon as they could see over the counter. and potatoes for the fries, determining that only quality items would find their way to the menu. Within a couple of years, they had earned the reputation of the “best beef in town”. When customers moved out of state they demanded that when their relatives visited “they must bring Tony’s beef by the pound” with them. Due to the large request for “beef by the pound”, they began a “catering” service. We also, began expanding the menu to include new items such as mouth watering Sicilian steak, breaded steak and several chicken sandwiches. You can even find a tasty breakfast sandwich in the morning. 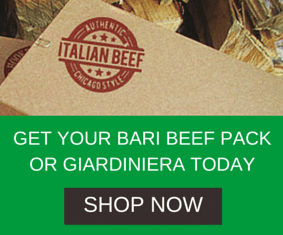 Tony’s Italian Beef is committed to serving the Chicago land area with great service and excellent food. We also, look forward to having you as lifelong customers. When was the last time you had a really great sandwich? Buy any 2 Sandwiches and get a 3rd of equal or lesser value for only $1.00. Not valid with other coupons or offers. Limit one coupon per customer per visit.